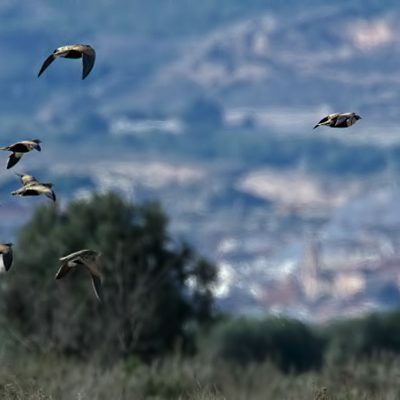 After a disappointing visit to Fuerta Alamo, on Friday, Bryan and I thought we would give it another shot and try to get all the target species at Alcanara Plains, Murcia Province. We arrived just after 09.00 and spent all day in the area. Using the car, we criss-crossed, did the dirt tracks, the circuits, across the plains and it paid off. The light was perfect and we had our minds on Little Bustard, Black-bellied Sandgrouse and Lesser Short-toed lark. 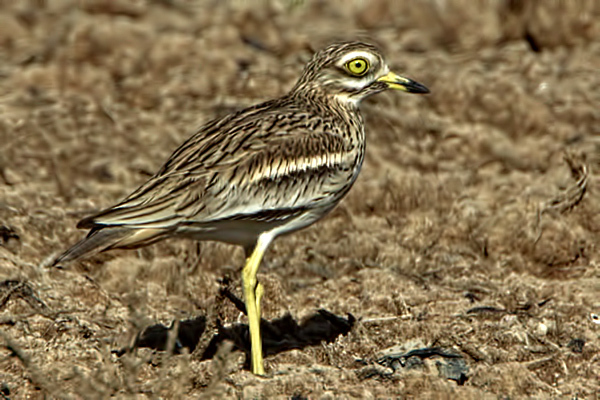 While scanning the many small reservoirs, dotted all over the shop on the plains, I noticed a single Stone Curlew in a ploughed field nearby. On closer inspection we discovered there were a few more. 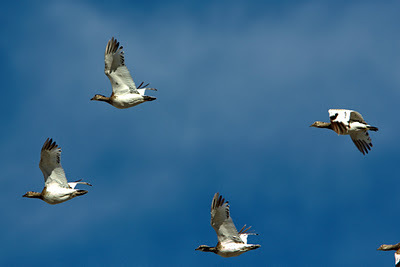 When the whole lot got up, we were stunned to see that there were well over 200 birds in the air! Water Pipit, Black Redstart, Stonechat and Cattle Egret were in small numbers, while Crested Lark, Skylark and White Wagtail were in the hundreds. I looked to the skies and picked up a distant Golden Eagle. Later we got 2 birds together a lot closer and the odd Buzzard popped up too. As we approached a large stubble field, Bryan commented that this looked good for sandgrouse and within seconds of him saying that, we could see 11 Black bellied Sandgrouse. 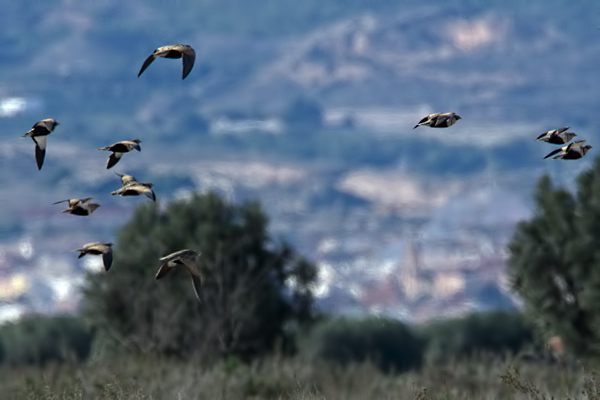 They didn’t stick around and were off with the other 36 sandgrouse that we didn’t see until they started flying. Fortunately, they came down two fields away and we got cracking views. It was too short and they were off again, this time to the far end of the plains. After seeing that brief flyby of a single bird overhead at Petrola last week, today I could really appreciate these top quality birds, in flight, showing off their deep black bellies with pale upperparts and they sure could motor. We moved on and cut through the plains on one of the many central dirt tracks. We ended up on the road near to where we started and as I turned left, a female Marsh Harrier flew low overhead. This was followed by a small party of medium sized birds. 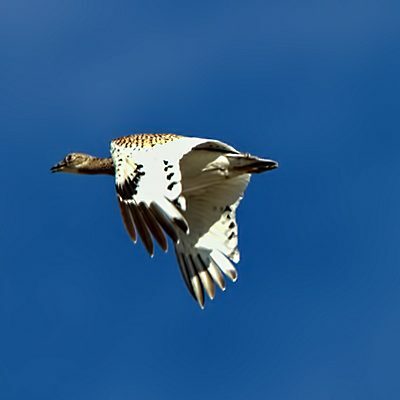 We were looking directly into the sun and it was not until I could get my bins on them, that I shouted ‘LITTLE BUSTARD’, Bryan was out of the car and onto them within seconds! At very close range, the 30 bustards circled us twice before settling down, not too far away, on the plains. We guessed that the passing harrier put them up. 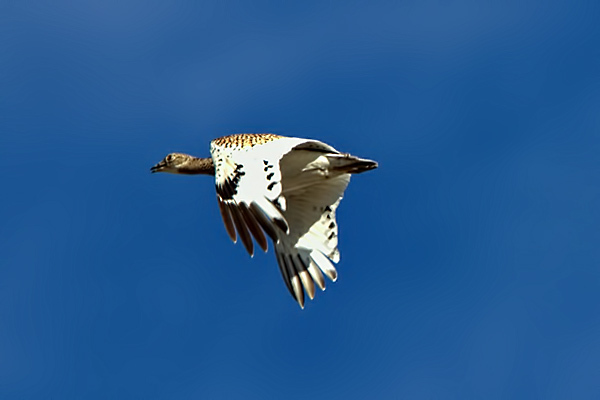 The bustards were also a new species for Bryan and we both wanted to see them on the deck. Searching for nearly an hour in the area where we thought they had come down, resulted in seeing the Stone Curlews again and the female Hen Harrier that we saw here a few days ago.